Happy Bloggers Challenge Friday! Thanks to those who played along with last weeks Red, White and Blue Challenge. This weeks challenge is To Die For (use die or an electronic die cutting machine). Before I share the details on my project, I wanted to thank everyone who stopped and left comments on my blog posts for the STAEDTLER Sweet Summer Giveaway! The random winner from the comments left on my blog posts is Debbie K. Congrats Debbie, please contact me with your information so I can have the prize package mailed out to you! To create my card, I used the Silhouette Cameo and the Rocking Card SVG file to create my shaped card, cutting the shape from Espresso card stock and Graphic 45 Little Darlings paper collection. 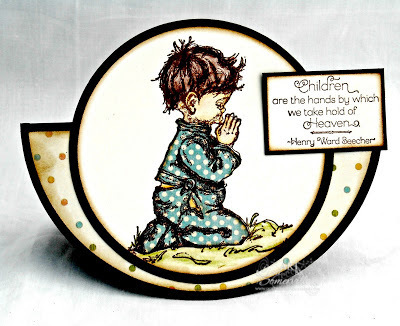 The sweet little boy image and quote are a sneak peek from Our Daily Bread Designs Precious Boy stamp set being released, tomorrow June 1, 2013 which is available for purchase here. The image is colored with STAEDTLER ErgoSoft Watercolor Pencils and paper pieced with scraps of the Little Darlings Graphic 45 collection. If you'd like to play along with this weeks Bloggers Challenge, please link back to this post on your blog and mention you created your card for the Bloggers Challenge To Die For Challenge. Please add your link using the Link Tool below, your link should be a direct link to your Bloggers Challenge Post, use your name as the Title. Please do not link to cards that were created prior to the challenge date. Entries not linking properly, or backlinked will be removed. If you have the captcha enabled on your blog, please consider turning it off, as it makes it so much easier to leave comments. Lisa I love your work...If I wanted to get involved and take the challenges do I need to uuse only the Daily Bread stamps? Lisa, this is adorable! Love the paper pieced pajamas--too sweet! Such a sweet image. This shaped card is perfect for it. Such a great card, love the shape and that image is just darling. What an enchanting image, and the rocking card shape is a delight! Congrats to Debbie! Congratulations Debbie! This card is adorable! TFS! Sweet new image, and a rocking card, had not seen that before, how cute. Lovely card, Lisa. That image is adorable, and I love the rocker-card design. Awwww, so very sweet, love the shape too! Such a sweet card! Great design shape and image is too cute! Love it!